This is the recommended thread for downloading, and posting any questions, suggestions or support queries for OctaneRender for Poser STABLE RELEASE. Pls read http://poserphysics.blogspot.com.au/2016/03/before-you-submit-octane-support.html prior to posting support issues. Windows: Poser9/PoserPro2012, Poser10/PoserPro2014 and Poser 11/11 Pro, on Windows XP, Vista, 7 and 8. OSX : PoserPro2012, PoserPro2014 and Poser 11/11 Pro 64bit, on MAC OS X 10.9.4 onwards. Windows : Nvidia drivers 344.x or later. Avoid Nvidia driver 361.x. For Network Rendering, you must use the Octane slave release 2.25 available from the Commercial Product News & Releases subforum. - config.xml, which is in C:\Users\[username]\AppData\Roaming\Poser Pro\9 for Poser 9/2012 and C:\Users\[username]\AppData\Roaming\Poser Pro\10 for Poser10/2014. - Specular map image power defaults to 1 at the moment for skin materials with specular maps. Probably should be about 0.2. This is different from the behavior when using the keyboard to enter material/texture settings (e.g., rotation/scale values) - those seem to work like you'd expect. 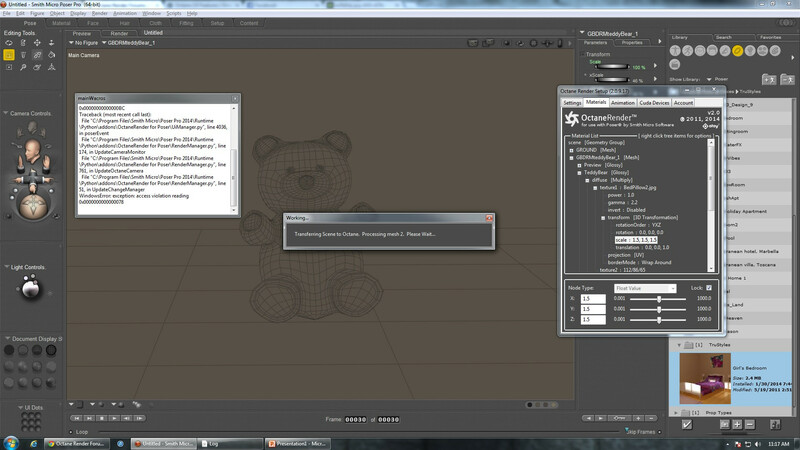 Then the plugin freezes and I have to force close Poser. Subdivider: The specified subdivmesh contains disconnected surface components. Apparently there's something wrong with the mesh, but a freeze seems like a severe reaction. [Edit] I just remembered that subdivision isn't supported for props (figures only), is that the problem? But still, a freeze seems a bit severe? The figure/prop needs to be welded for Octane subdivision (and rounded edges). 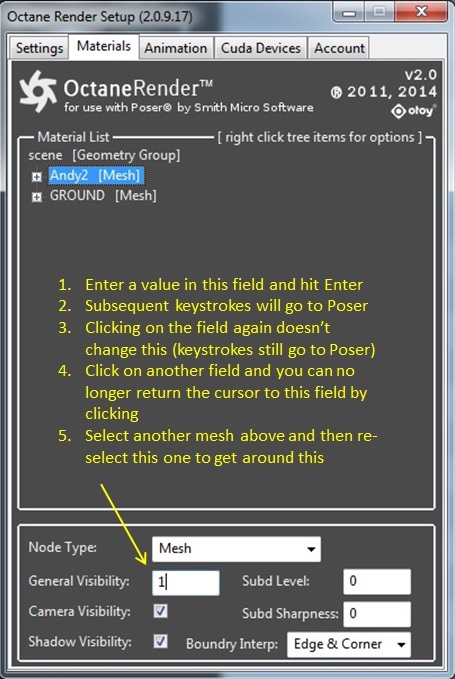 Did you run the Weld script in the Octane Plugin menu in Poser? Ah ok, thanks for the info re: subdividing props. I hadn't tried welding it, but I just did, and I still get the same errors. The prop renders fine with 0 subdivision, though. I've been getting a lot of Cuda Error 702's, especially when messing with displacement. Sometimes causes Poser to crash as well, but not always. CUDA error 702 on device 1: The device kernel took too long to execute. This can only occur if timeouts are enabled. The context cannot be used anymore and must be destroyed. All existing device memory allocations from this context are invalid and must be reconstructed. CUDA error 702 on device 0: The device kernel took too long to execute. This can only occur if timeouts are enabled. The context cannot be used anymore and must be destroyed. All existing device memory allocations from this context are invalid and must be reconstructed. FYI, I have two GTX 670's (Though I typically only use one for rendering to keep from lagging the computer). Yes, I noticed this two, and spent many hours trying to fix it - by python conspired against me. I will take another look. Can you send me the prop pls? Potentially the displacement amount is too high. Pls refer to the "Displacement" section of the manual at http://render.otoy.com/manuals/Poser/?page_id=298. Actually, it seems like it could be a problem with Octane itself, not the plugin. Loading the OBJ into Standalone and increasing the subdivision to 1 makes it crash instantly. In case you still want to test it, though, here's the OBJ, which should be all you need (hope I'm not violating any copyright laws!). Thanks - I'll submit it to the Otoy devs for actioning. The Otoy devs have investigated this issue and found the error to be happening inside the OpenSubiv library (which is external to the Octane library). So it will not be a simple fix, but they are looking into it in more detail. So for figures which cause this error - use Poser Subdivision instead of Octane subdivision.